Come home to some of the largest apartment floor plans offered in Tempe at Camden Sotelo. Just minutes from Arizona State University, our community has multiple one and two bedroom apartment floor plans available for you to choose from. 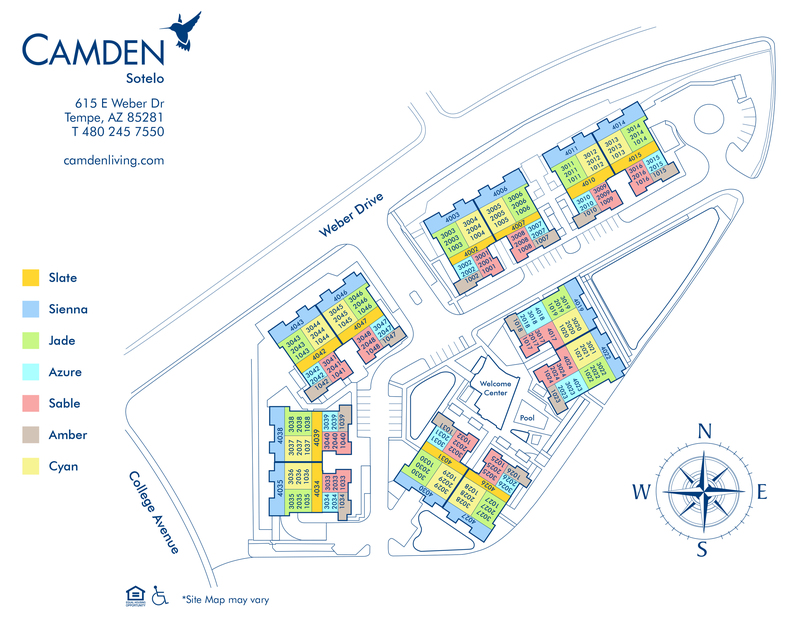 With our average floor plans boasting around 300 square feet more than nearby apartment communities, you are sure to find the living space that is perfect for you and your family at Camden Sotelo. Besides spacious apartments, Camden Sotelo offers upgraded apartments featuring, open-concept floor plans with granite countertops, stainless steel appliances, washers and dryers in every apartment and large walk-in closets. We also have chef-inspired kitchens and private patios, ideal for entertaining friends. Camden Sotelo offers select penthouse-style apartment homes with dens that can be used as an office or guest room. At Camden Sotelo, every apartment feels like a luxury home. Take the full tour and find out what makes Camden Sotelo special. We've got plenty of amenities to make your life easier. Relax in our resort-style pool and spa, or just hang out and enjoy our complimentary WiFi available in our common areas. Camden Sotelo also offers dry cleaning services, see the amazing team at the Camden Sotelo leasing office for details. With an on-site fitness center, you’ll be able to ditch that monthly gym membership fee. Camden Sotelo is a pet-friendly apartment community and offers pet stations throughout the community. In Arizona, keeping your car cool is a necessity. Camden Sotelo has underground parking garages in every apartment building, as well as an assigned parking space and visitor parking options. With elevators in each apartment building, moving in and bringing groceries or shopping bags home is a breeze. Located just about a mile from Tempe Town Lake, Camden Sotelo apartments are close to plenty of shopping and entertainment. Camden Sotelo is only a few miles from Tempe Marketplace, Scottsdale Fashion Square, and Casino Arizona, where you can catch a movie, dine at one of over 20 restaurants or shop at one of over 100 retail stores. Just minutes from the Light Rail and the 202 FWY, you are always close to where you need to go. The good life in Tempe, Arizona is waiting for you. Come home to Camden Sotelo. Each one bedroom apartment home includes one assigned parking space in the underground parking garage for $25 monthly and each two bedroom apartment home includes two assigned spaces for $50 monthly. We have ample open parking for our residents and visitors on a first-come, first-served basis.